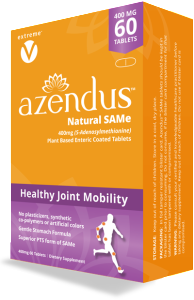 Azendus™ SAMe’s active ingredient is (S-Adendosylmethionine Butanedisulfonate). This compound is made primarily in the liver as a byproduct of the metabolism of the amino acid methionine. 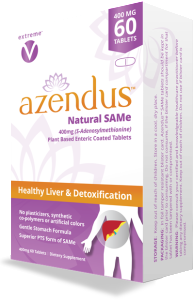 Azendus™ SAMe active ingredient has been approved in Europe for decades for liver health, joints, mood, brain and to support proper inflammatory response. SAMe is a naturally occurring molecule found in all living cells. This remarkable natural molecule works quickly; most feel and notice a difference within two to three weeks- clear, distinct and often life changing benefits. 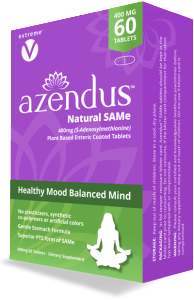 People feel more youthful both emotionally and physically as Azendus™ improves mood and detoxifies the body. Full Potency 400 mg Azendus™ SAMe (net yield) is derived from 800 mg of SAMe (S-Adendosylmethionine Butanedisulfonate). Full Potency 200 mg Azendus™ SAMe (net yield) is derived from 400 mg of SAMe (S-Adendosylmethionine Butanedisulfonate). 2015 Azendus™ plant based GRAS enteric coating is launched in North America. Azendus™ is the only SAMe with a Natural Plant based coating. No chemicals, No plastic material – only pure Pharmaceutical Grade SAMe and Gentle Plant derived materials. Supports healthy liver function, joint mobility and mood. Azendus™ SAMe is made via Fermentation, like wine. SAMe has been the subject of hundreds of Clinical Studies. Five years of research and millions of dollars in development. Each tablet is individually packed to insure product integrity and freshness.